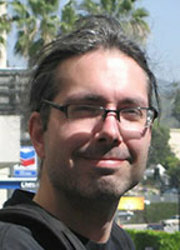 Martin Picard is a lecturer and postdoctoral researcher. He returned from a one year stay in Japan as part of a research project on the culture of Japanese video games at Wako University in Tokyo. Previously, he was a postdoctoral fellow at McGill University and received his Ph.D. in literature and film from the University of Montreal. His teaching and research focuses on Japanese film and popular culture, history and aesthetics of video games, and digital cinema. He has published several articles and book chapters in scientific journals and books dedicated to the study of video games and Japanese pop culture.